Living outside Metro Manila, but still want to celebrate self-care? Then you're in luck! 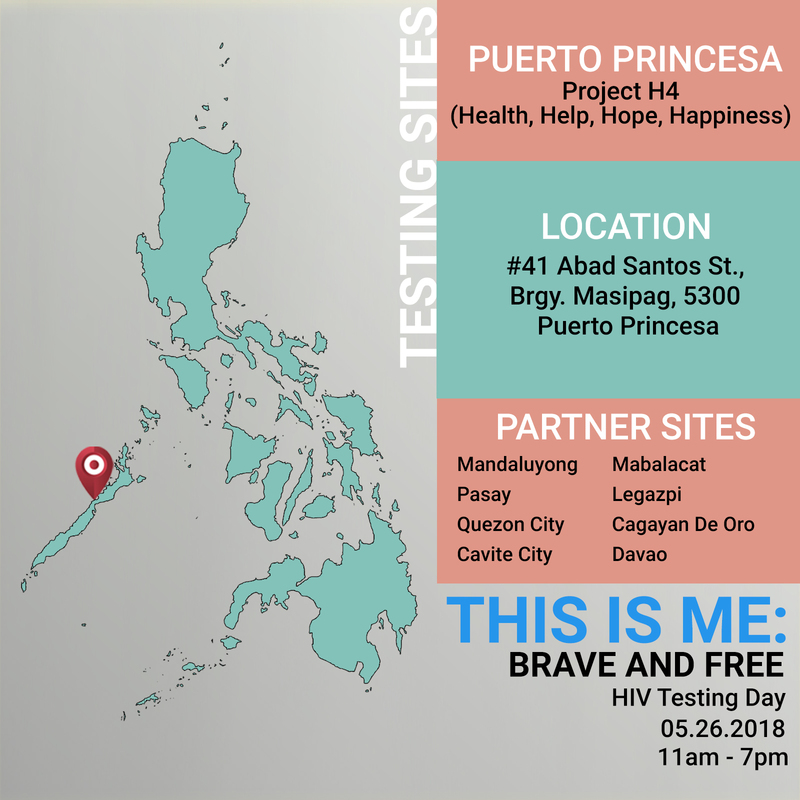 This is Me: Brave and Free is hitting six cities through our partner community based organizations. 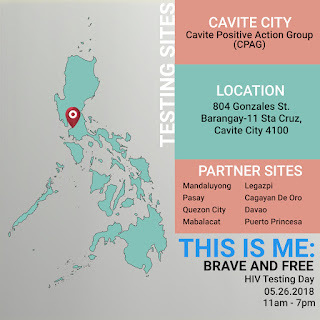 On May 26, 2018, Loveyourself, Inc. together with community-based organizations are launching This is Me: Brave and Free – the first community-led multi-site HIV testing day in the Philippines. Nine like-minded organizations banded together to expand the reach within and outside Metro Manila. Get to know your status with the fast, free, and confidential community based-screening (CBS) process. Go to https://bitly.com/ThisIsMe2018 to sign up! You can also walk-in too! CAGAYAN DE ORO: Kagay-an PLUS, Inc. Preserving life and uniting society is what it means to be a PLUS, at least for Kagay-on PLUS (KPLUS), Inc. 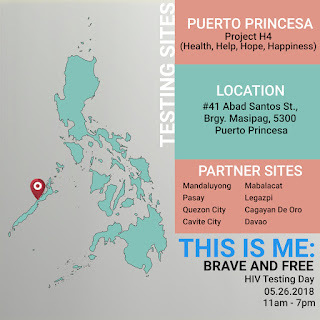 They envision being a leading organization that promotes a non-discriminating and gender responsive society for people living with HIV (PLHIVs) and Lesbian, Gay, Bisexual, Transgender, Queer, Intersex + (LGBTQI+) through peer education and trainings on sexual health and Community Based HIV Screening (CBS). 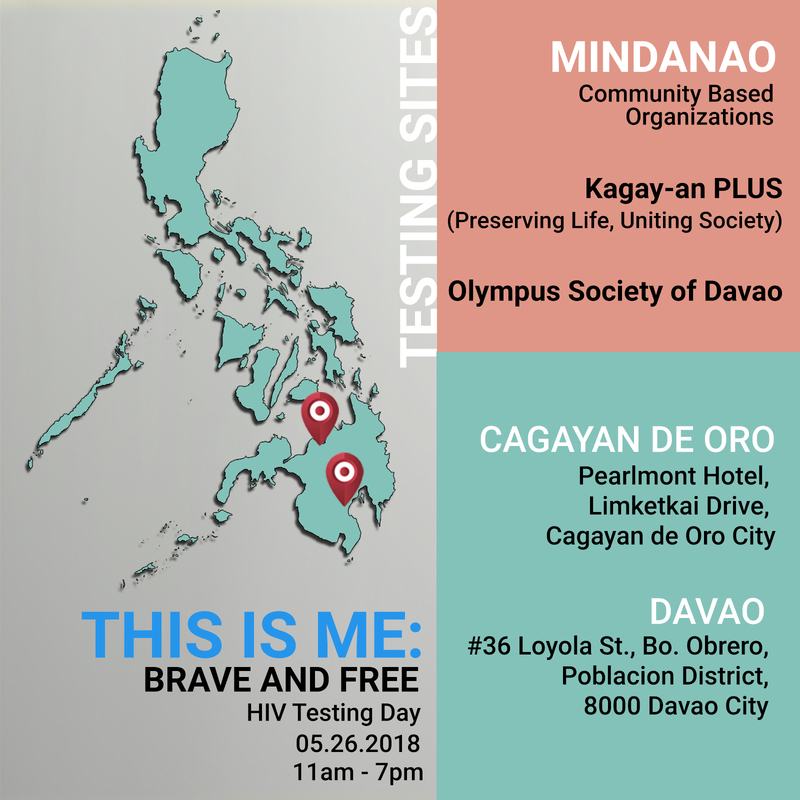 The operations of Kagay-on PLUS, Inc. during the up-coming This is Me: Brave and Free is powered by the Department of Health - Regional Office X. They will conduct CBS at Pearlmont Hotel which is located at Limketkai Drive, Cagayan de Oro City. You will find it at the back of Limketkai Mall. You may ride the RA NHA jeepney from Divisoria at the BBQ Station near Xavier University or any jeepney from eastern part of CDO en route to Cogon Market. Anyone near Cagayan de Oro City may visit KPLUS, Inc.’s clinic from Mondays-Fridays, 9:00 a.m.-4:00 p.m. For more information, call or text them via 09154833542, 09959918622, 09264506251, and/or 09985823949. Enrico Nino L. Patricio, the Executive Producer of K-PLUS will be more than happy to assist you. Join their battle to promote sexual health and human rights. 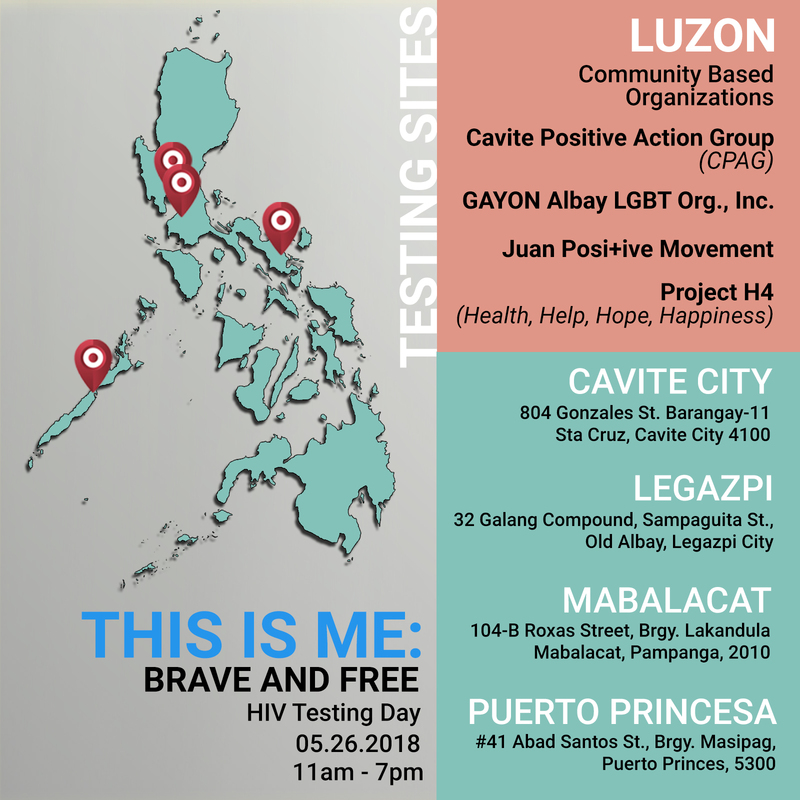 CPAG, Inc. is committed to help not only the PLHIV but also their family who are also affected by the situation. Like other HIV advocacy groups, the promote HIV and AIDS awareness and prevention. But what is peculiar about CPAG, Inc. is their focus on psychosocial intervention by offering care and support to their client’s social and emotional development. In fact, they envision being a center for counseling and treatment. You may visit CPAG, Inc. on the multi-site testing day Sta. Cruz, Cavite City. You may take a bus from Baclaran going to Cavite City. Ask the conductor to drop you in the street of Himlayang Caviteno. From there, you will see Barangay 11 Gonzales with sign board of CPAG.ORG. You will know you are at the right place when you see This is Me: Brave and Free posters. Their lines are also open via landline numbers: 046.235.5608, 046.697.2750 and mobile numbers: 0927.555.3806, 0928.285.8238, 0921.978.1651, 0947.288.4574 and 0997.593.7796. You may also contact them via email: cpagorganization@gmail.com or cpagorg@yahoo.com or read more about them here. This organization emanated from the Elite Bi-Male Organization founded by Mr. Sky which was then continued by Mr. Oscar Obenza and gave it a new name: Olympus Society of Davao. It has been advocating for HIV awareness for three (3) years already. Olympus envisions an empowered LGBTQI+ community who can fight for and strengthen their rights as individuals and as a community. Its ultimate commitment is to help raise social awareness on human rights and mobilize related advocacies pertaining to is such as the world-wide battle for sexual health. As a community-based organization, they find joy and fulfillment in all their undertakings. Even if they face different challenges in their finances and workforce, they still remain steadfast with their goals as an organization. This brings them to have free HIV Screening as one of their primary services. 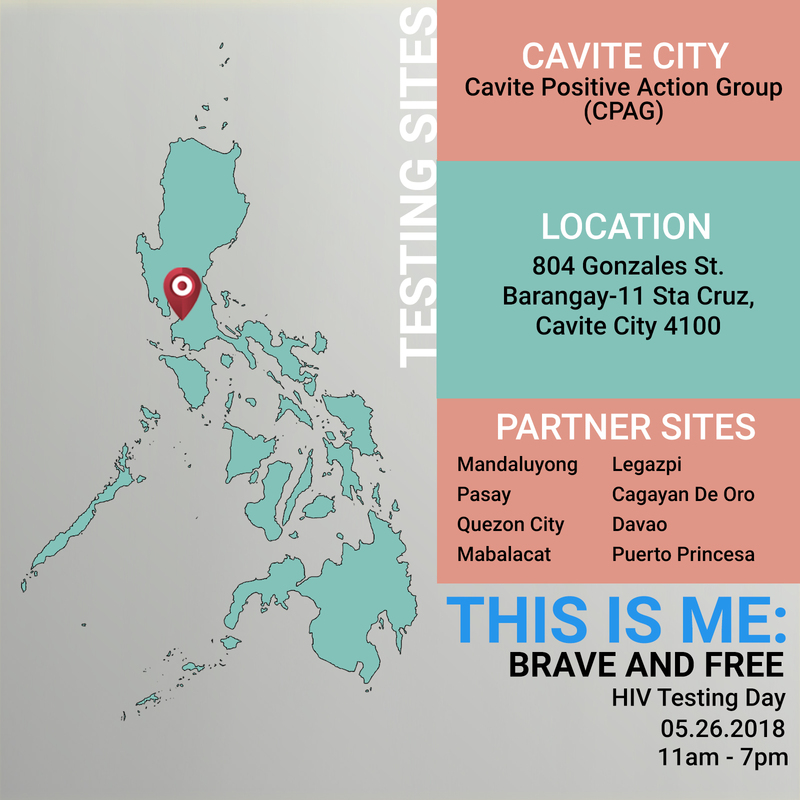 Visit them on May 26, 2018 and be part of the first ever multisite HIV tasting day. Olympus Society of Davao operates from 4:00pm to 10:00pm daily and can be located at Bo. Obrero, Davao City. They may also be reached through 327-3839. 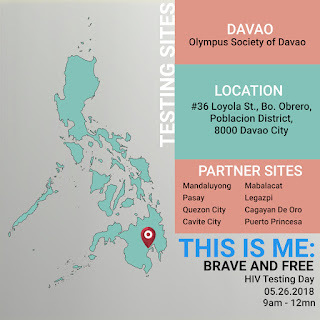 Be brave and free, Davaoenos! Gayon started in 2007 as a small group of volunteers for a relief operation after a typhoon hit Albay. This experience lit their burning passion today to help their community by supporting starting community organization like the. Their mission took them to be part of the growing number of advocates for STI/HIV/AIDS education. Gayon is committed to campaign for HIV/AIDS Education, conduct workshops and peer education training, counselling, Community-Based Screening, Referrals and CBO Organizing. They do this with great success in partnership with the Department of Health Region V and other LGUs such as but not limited to Tiwi, Legazpi, Daraga and Sto. Domingo. Gayon encourages their kababayans to be part of This is Me: Brave and Free regardless of their economic status, religion, sexual orientation and gender identity. Residents of Albay braved countless natural disasters. 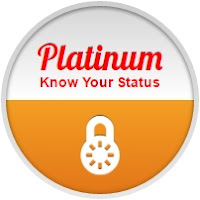 It’s high time to gather courage to know your HIV statuses for early detection and prompt treatment. PAMPANGA: Juan Posi+ive Movement, Inc.
Juan Positive Movement (JPM) Association Incorporated has been the community since August 2016. It started from series unfortunate events experienced by its founder such as prejudice, rejection and discrimination turning it into a source of motivation which transpired to a mission that no PLHIV should be discriminated and no PLHIV deserves to experience such hardships through the course of their survival. From then on, JPM was established with the inspiration to create a support group that will help reduce stigma and help PLHIVs retain their self-esteem, self-worth and self-efficacy. Their main goal is to convey a strong message to the public regardless of their Sexual Orientation, Gender Identity and Expression that awareness of their HIV status is a social responsibility of every “Juan Dela Cruz”. Through this, they help normalize and promote testing and enhance linkage to care among our key population. They are committed to eliminate fear and misconceptions which serve as the biggest barriers in accessing the services that our national and local service networks offer. They do all these by empowering MSMs and TGWs to come together and create a domino effect of positive change. JPM’s primary services are HIV Counseling and Screening, Life Coaching, Condoms and Lubricants Distribution and HIV education. What’s unique about the services of JPM is their temporary shelter for PLHIVs. Not to mention they provide technical assistance, facilitate referrals, internships and outreach services. Have a try and visit them at Mabalacat City, Pampanga. You may take an Angeles City bound jeepney from Puregold Dau to Uratex JMC Enterprise or contact them via Lounge Help Hotline: 09561429240 and 09173068423, and Email: jpmoffical@juanpositivemovement.com. Project H4 started as a Facebook page group of bisexuals named BiOutLoud-Palawan. In May 2015 we partnered with PPC-CHO and DOH-MIMAROPA to hold Mr. Pogay Pageant, and exclusive grand eyeball for bisexuals. From there we had our first mass testing that alarmed the Region with the number of new cases we had. Founded by 4 individuals (Yuan, Bob, Jester, and June), Project H4 got its name which H4 stands for 4 Heads/Founder, H4 in roman numerals is HIV, and its goal to provide and promote Health, Help, Hope, and Happiness. The group aims to promote awareness on HIV, AIDS and STI in the community, and help those who are directly affected. They envision being one of the leading contributors in the reduction of HIV, AIDS and STI cases in the Province of Palawan. You may visit Amos Tara Community Center at Puerto Princesa City, Palawan. They are open from Wednesdays to Mondays, 10:00am – 8:00pm. 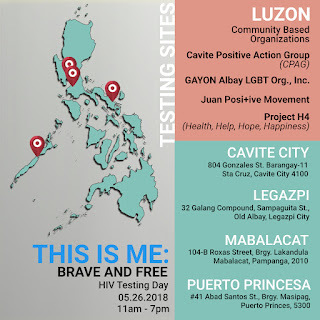 Project H4 shares to the public that Regular HIV screening is just one way to take care and valuing ourselves. Be BRAVE by conquering your fear of knowing your status and break FREE from stigma. There you have them, the six participating community-based organizations ready to serve you on the first community-led multi-site HIV testing day in the Philippines on the 26th of May 2018. 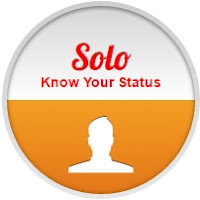 We are also enjoined by partner testing-sites within Metro Manila. Meow is a nurse and social worker by profession. Wide-awake at midnight (best time to be with him). Leaves nothing but paw prints in his trail (follow at your own risk @meow.rnrsw).